Opulent and somewhat off the beaten track, the Kalkan area is a unique Turkish Riviera experience. Upon entering the town, the first sense is a beautiful azure sea. A steep hillside leads to a hazy Mediterranean sea-view with small islands as the picture-perfect backdrop from all areas. Perhaps the epitome of modern luxury living, Kalkan brings together contemporary lifestyle aspects such as yachting, lounging, and fine dining with a sense of nostalgic beginnings.Small enough to avoid mass tourism and far enough from an airport not to have travellers ambling by, an almost self-contained, sophisticated lifestyle has developed in this unknown fishing village. The old town, made up of lovely traditional buildings with bougainvillaea hanging off balconies, has taken another direction in recent decades with the construction of large, luxury mansions but the perfect blend doesn’t distract from its nostalgic roots. 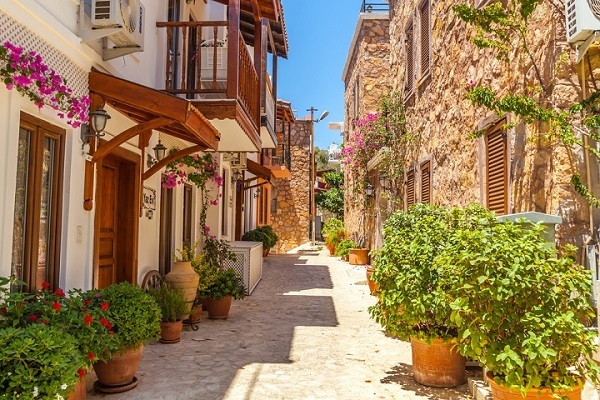 Small alleyways hint at the town’s history, which was once home to Ottoman Greeks and Turks and called by the Greek name of Kalamaki. The Greek residents have since left with the small fishing village changing to become home to bohemian Turks allured by the harbour’s beauty and surrounding landscapes. Coming to be known as Ottoman Greek architecture, the buildings in the old town are now homes to shops and restaurants. Kalkan has over 100 restaurants, known to be the highest ratio of restaurants to inhabitants anywhere in Turkey. Eateries and evening drinking spill out onto rooftop terraces where the chatter and the chiming of cutlery continue until the morning hours. Venturing away from the main town and you meet ultra-modern villas peering out towards the sea. Here the more recent history of Kalkan becomes clear. Infinity pools and floor to ceiling windows are a testament to brilliant sea views. These new homes worship beautiful scenery and sunsets. Although no longer a secret, few other areas in Turkey match Kalkan’s mystique. Shrouded in history and with brilliant landscapes, Kalkan is an exclusive Turkish Riviera destination. Where is Kalkan in Turkey? Kalkan is on the Mediterranean coast of Turkey, also known as the southwest. Belonging to the vast Antalya region, it sits between Kas, another delightful coastal resort and Patara, a rustic village famed for its sandy beach, the longest in Turkey. Car drivers will find it so easy to get to Kalkan because it sits just off the D400 highway running alongside the entire Mediterranean coastline. If travelling by bus, small dolmuses run to and from neighbouring resorts like Kas, although if you are coming from other areas in Turkey, you will need to first get a bus to Antalya or Fethiye and then catch a connecting route from there. Where is the Nearest Airport to Kalkan? Dalman, the nearest airport is 120 kilometres away with a transfer time of 90 minutes. As one of Turkey’s top touristic airports, its frequent summer flight schedule serves thousands of people. Scaling down in winter to essential services, residents also use the busier Antalya Airport with its year-round flight schedule, a three-hour drive away. Weather and Climate: When is the Best Time to Visit? 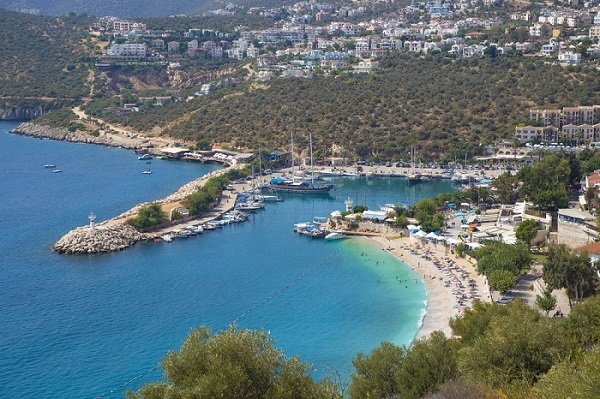 Kalkan’s Mediterranean position makes it an ideal weather trap with residents enjoying hot summers, and mild winters. The rainy season from January to March can be a damper on the spirit, but temperatures are still higher than other regions in Turkey like the Aegean coast. People who like to explore the great outdoors should visit from April to June and from the end of September to November, for cooler temperatures and lower humidity. Anyone who wants to relax on beaches and build up a golden sun-kissed tan should visit between May to October, but temperatures rise and days are longer between July, August, and the beginning of September. For expats, the year-round climate is a perfect blend of Mediterranean temperatures. The harbour district is where it all began, but also the beating heart. Holiday-makers would do well to look at accommodation in this area because it contains the largest concentration of bars, restaurants, and excursion shops. For locals, life revolves around the harbour during summer as anglers bring in fresh catches and holidaymakers depart on a lazy day cruise around the coastline. It also offers easy access to the main public beach where sunbeds and umbrellas are available to rent, and backing restaurants serve up full menus for lunch and refreshments. Sitting opposite of the central bay, the residential Kisla area of Kalkan receives a steady stream of holidaymakers who rent large, luxury, waterfront villas. During summer, its west facing position gives way to fantastic sunset views, but throughout the year, a marvellous view over the bay emphasises the Mediterranean lifestyle. A 25-minute walk takes you into town, but seclusion and privacy combined with copious amounts of luxury is its appeal. During summer, an alternative and quirky method of transport, the local water taxi, takes just 10 minutes and enables you to enjoy the best of both worlds. As well as the Kisla area and town centre, four other neighbourhoods make up the central and outskirts regions. Ortaalan often called New Kalkan, is home to supermarkets, and the central bus station. Kalamar and its stylish beach clubs is the perfect place to head to in summer. Komurluk is much like Kisla in that its prestigious status leads the way to millionaire mansions. While Kiziltas, on the other side of the D400 highway offers amazing views because of its elevated lands status. Read more about the districts of Kalkan. Enjoyment on summer evenings in Kalkan means indulging in the seaside, alfresco dining scene. Rooftop and harbour restaurants serve many menus including international, Mediterranean, fresh fish and seafood, and Turkish cuisine. Whether you want fast food to go, or to dine in complete luxury, local restaurants offer enough choice to keep you dining out all year round. Some favourite establishments as rated on Trip Advisor include Sade, a rooftop restaurant serving sumptuous steak dinners, although it also has a vegetarian menu. Large groups of friends often favour Yelken café and Bistro’s homely ambience while couples love the romantic atmosphere and delicious seafood menus, of harbour Lipos restaurant. You won’t find any large, pulsating nightclubs but plenty of after dinner bars serve cocktails, wine, spirits and beers while providing family-friendly sit-down entertainment. One thing is for sure. You’ll never be bored. A massive range of self-guided activities and group tours, within the town and other coastal delights make summer fun. Popular excursions include daily boat trips, jeep safaris, horse riding, and village tours. It is also worth signing up for excursions to visit Patara, Letoon and Xanthos of which the latter two are UNESCO World Heritage sites. As part of the Turkish Riviera, three-night gulet cruises from the town take you to explore places like Fethiye’s 12 islands, while our favourite activity is heading to neighbouring Kas to catch the Meis ferry and indulge in the alternative Greek culture, that despite being related is vastly different. Scuba diving is big business, whether you want to start with a poolside try-dive or qualify for your PADA certificate. The nearby Kaputus beach, one of the most photographed in Turkey, is also a firm favourite with families, but many holidaymakers and residents also hire a car to visit places like Tlos ancient ruins and Saklikent Gorge. 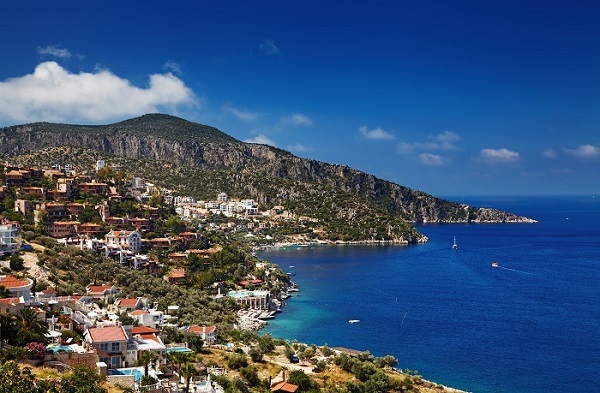 Kalkan’s reputation for luxury attracts holidaymakers who rent large, luxury villas, but a small community of expats also live there all year round. Although in winter, daily life scales down a notch, they enjoy a Mediterranean lifestyle, and anyone thinking of making a move is assured of an existing network of advice, help and communication to use. Many year-round foreign residents have also bought property ranging from one-bedroom, central properties to large six-bedroom villas. For those who don’t live there, some rent them out in summer to recoup on running costs and maintenance. If you are buying property in Turkey, see our wide range of homes for sale in Kalkan here. Each listing contains photos, key features, location maps, and interior and exterior descriptions, and a request more information button to receive additional details via email. Alternatively, call us today to arrange a date and time to view properties in the stunning Kalkan area of Turkey. The Antalya Region: Kalkan belongs to the larger Antalya region of Turkey stretching east from the town up to Gazipasa. Comprising many smaller coastal resorts like Kemer, Belek and historical Side, they make up Turkey’s second most popular holiday and foreign property sales region. Our articles about Antalya include useful information for first-time visitors and helpful advice for overseas property buyers investing in Turkish real estate.